From left: Executive Head, Marketing & Customer Experience, Old Mutual, Mrs. Alero Ladipo; Executive Head, Business Development and Strategy, Hygeia, Mr. Obinna Ukachukwu; Managing Director, Old Mutual Nigeria Life Assurance Company, Mr. Keith Alford; Country Manager, Roche Products Limited, Dr. Ladi Hameed and Head, Retail Mass Market, Old Mutual, Mr. Kayode Odetola during the Critical Illness Cover partnership launch in commemoration of the World Health Day on Monday, April 8, 2019, in Lagos. 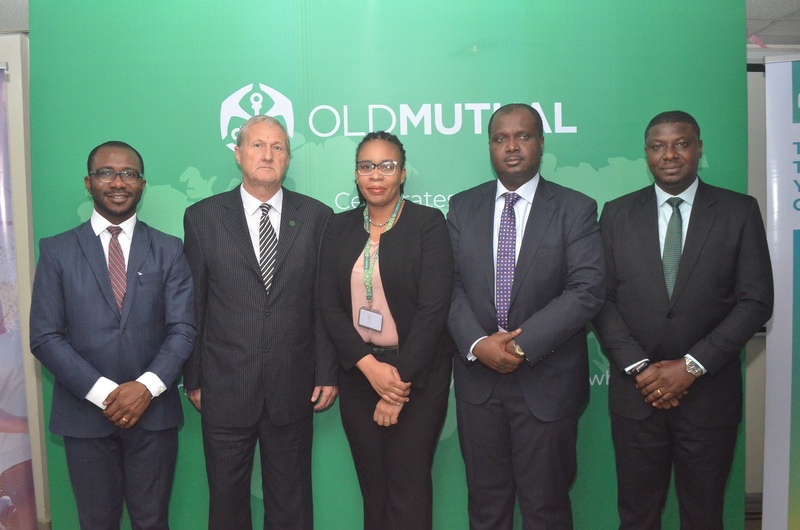 Old Mutual Nigeria Life Assurance Company, a subsidiary of the pan-African insurance giant and leading global financial services group, Old Mutual Limited, has reiterated its commitment towards the provision of financial protection against critical illness for Nigerians. The insurance company made this known today at a media parley in Lagos, which was held in commemoration of the 2019 World Health Day, themed “Universal health coverage: Everyone, Everywhere”. 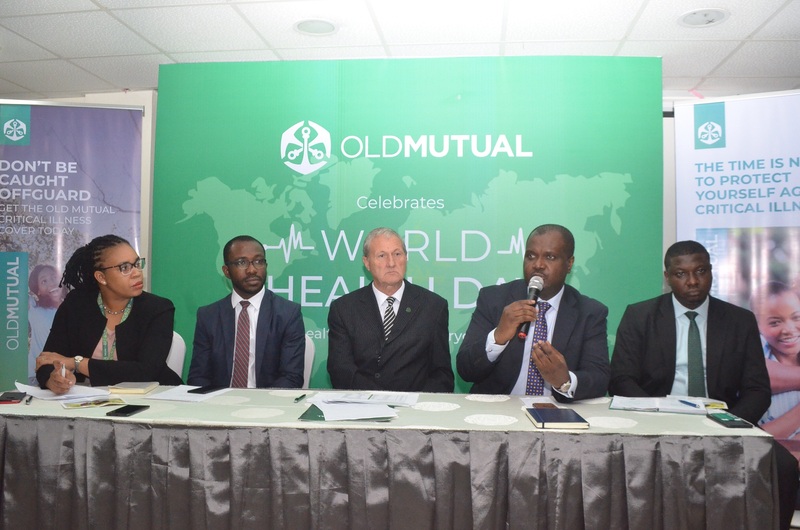 The Managing Director, Old Mutual Nigeria Life Assurance Company, Keith Alford, at the event, highlighted the importance of Healthcare Coverage, stating that with Universal Health Coverage everyone can obtain the right kind of medical care they need and in due time, without suffering financial hardship. Alford, also noted that this financial hardship becomes heightened in the cases of terminal illnesses, due to their sometimes prolonged costly treatment and deadly impact. “Currently, over 800 million people worldwide spend at least 10 per cent of their household budgets to pay for health care. In sub-Saharan countries like Nigeria, medical expenses are often made through out-of-pocket payments with little coming from government or privately structured healthcare management initiatives. In the case of terminal illness, many sufferers have lost their jobs and their source of income significantly affected. Families have been driven into poverty in a bid to raise money for the treatment of loved ones. Unfortunately, insurance which ideally serves as financial protection has not been fully utilised by Nigerians. “There is a need for us to plan with insurance policies specially designed to provide protection from the financial burdens of terminal illnesses. It is to this end that, we entered into a partnership with Roche to develop this innovative insurance plan to protect Nigerians from the financial implications of terminal illness. As we commemorate World Health Day today, we use this occasion to call on Nigerians to choose life and take up insurance as a protection against the financial burden of terminal illnesses, that usually invade lives unannounced”, he added. From left: Executive Head, Business Development and Strategy, Hygeia, Mr. Obinna Ukachukwu; Managing Director, Old Mutual Nigeria Life Assurance Company, Mr. Keith Alford; Executive Head, Marketing & Customer Experience, Old Mutual, Mrs. Alero Ladipo; Country Manager, Roche Products Limited, Dr. Ladi Hameed and Head, Retail Mass Market, Old Mutual, Mr. Kayode Odetola during the Critical Illness Cover partnership launch in commemoration of the World Health Day on Monday, April 8, 2019, in Lagos. The Country Manager, Roche Products Limited, Dr. Ladi Hameed, said Roche, will deplore its over eight years experience on handling of critical illness in the partnership, adding that the initiative will help in early diagnosis and support. He noted that with the product, individuals who suffer critical illness would no longer have to seek financial supports from the public. He encouraged Nigerians to embrace the product to secure their lives, stressing that some people who died from critical illness would have been saved if they adopted good medical channels, which the product provides. Executive Head, Business Development and Strategy, Hygeia, Obinna Ukachukwu, said the partnership will help his firm expand its services and coverage. Head, Retail Mass Market, Old Mutual, Kayode Odetola, noted that the product provides an optional 10 per cent cash back, plus the option to renew at the end of the term. He identified features of the product to include, minimum entry age of 18 years; maximum entry age of 67 years; ceasing age of 70 years; policy term of 3-15 years; maximum sum assured of N30 million; minimum sum assured of N500,000 and more.